Need to save space? Consider using Component Wall Shelves to facilitate your components and free up your floor space. Figure 1 shows 50″ Samsung TV mounted on the wall with 2 tier component shelf Product ID: 1013 (discontinued, replaced with Product ID: 1250) installed directly below the TV. All wires hidden. In order to hide all wires, a new electrical outlet and a cable jack had been installed behind the TV. The component shelf itself has wire management channel built-in so wires running up to the TV is hidden by the component shelf. 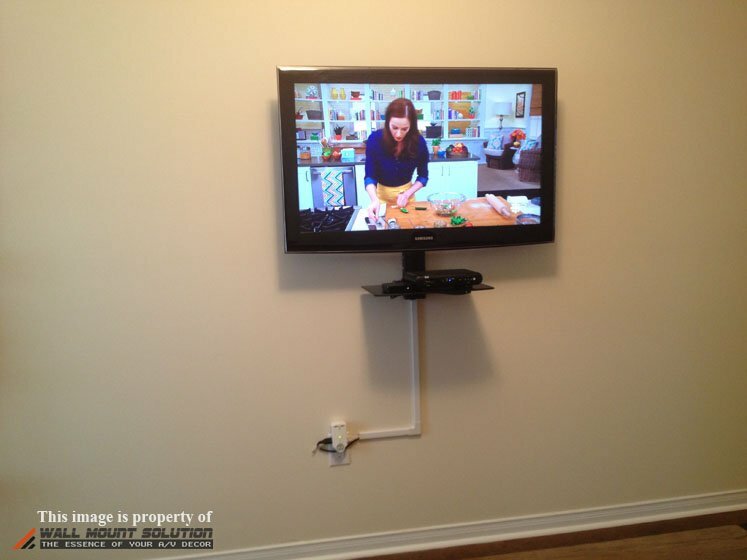 Figure 2 shows the electrical outlet and the cable jack installed high up on the wall where the TV will be mounted. 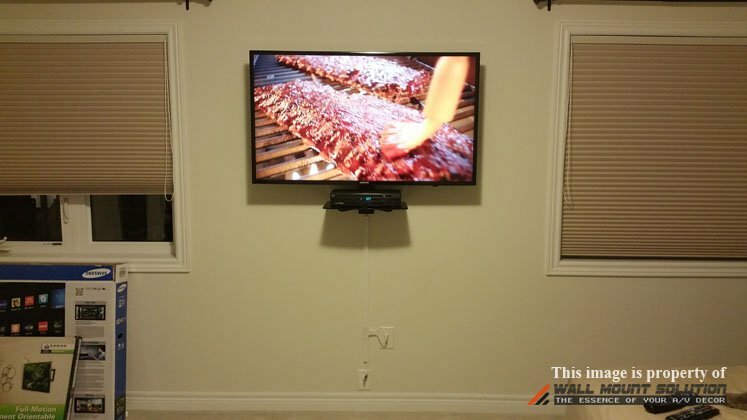 Picture below shows a 52″ Samsung TV mounted on the wall. 2 tier component shelf Product ID: 1013 (discontinued, replaced with Product ID: 1250) was installed to facilitate a Blu-ray player on the bottom shelf for now and top shelf is to be used for future expansion of components. New electrical outlet had been installed in order to hide all wires. Figure 4 shows a 47″ Toshiba TV mounted on a wall in Dining/Kitchen area. Single component shelf Product ID: 1057 is installed above the TV for the cable box. New electrical outlet and cable outlet was installed to hide all wires. 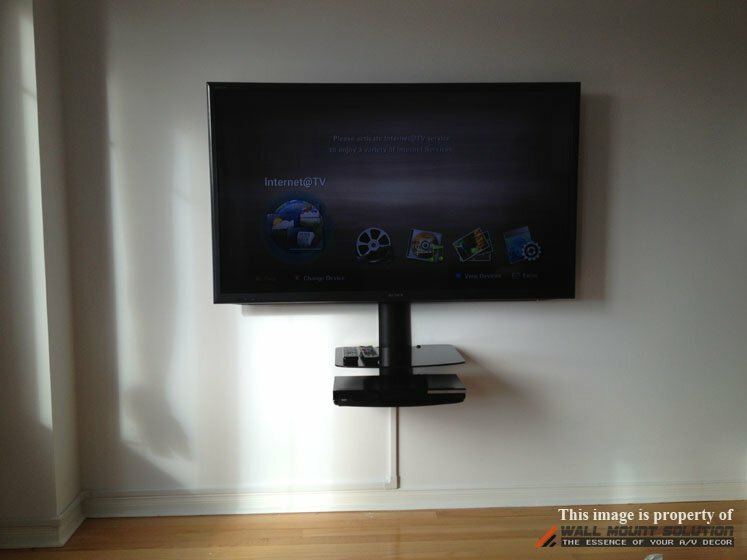 Figure 5 shows a 40″ TV and a single component shelf Product ID: 1057 installed above the TV to facilitate a cable box. Figure 6 shows a 40″ Samsung LED TV mounted in a small condo bedroom with component shelf Product ID: 1057 mounted right below it. New electrical and a cable jack had been installed behind the TV to hide all wires. Figure 7 shows a 46″ Samsung LED TV mounted in a master bedroom. 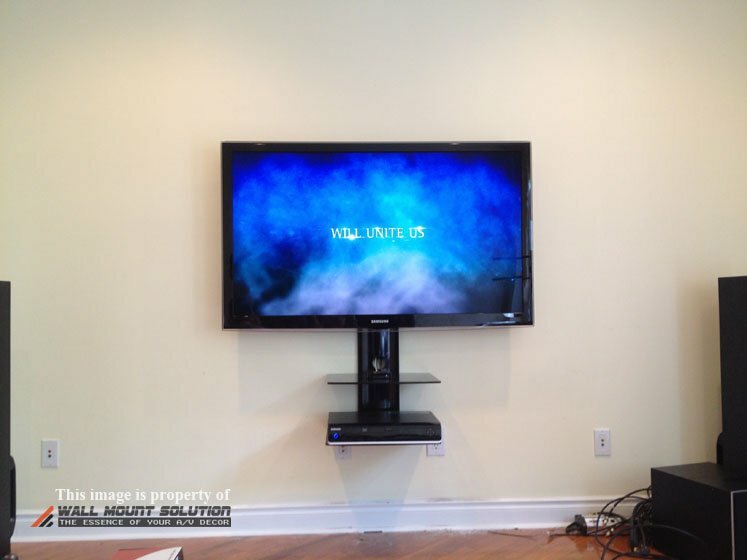 2 tier component shelf Product ID: 1058 installed directly below the TV to facilitate PS3 and WDTV live media player. New electrical outlet and a cable jack had been installed to hide all wires. 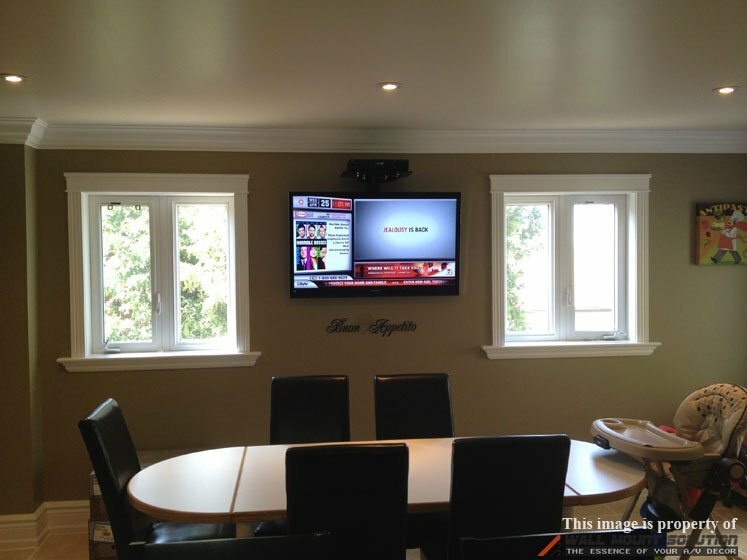 Figure 8 shows 60″ Sharp TV mounted in living room of a condo. Sound bar mounted above the TV using Sound Bar Brackets and 2 tier wide component shelves Product ID: 1125 installed below the TV to facilitate Rogers HD box, internet modem/router and PS3. Wires managed with wire raceway. 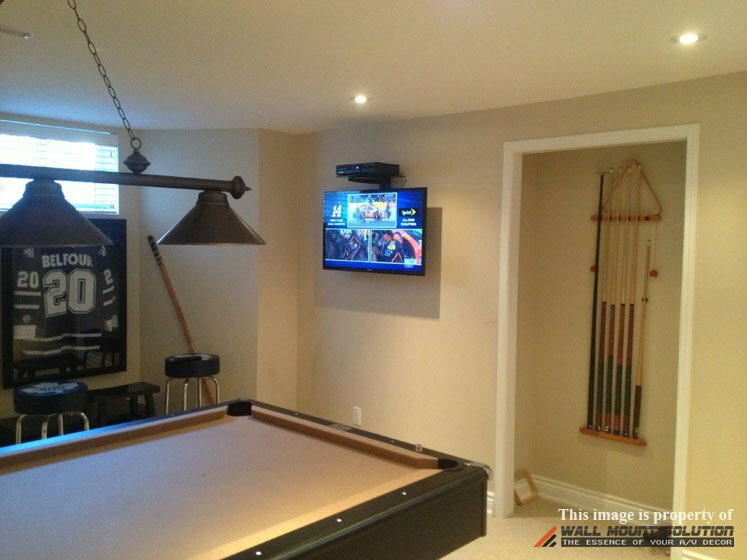 Figure 9 shows a Sharp 80″ TV mounted in family room of a house with 2 tier wide shelves Product ID: 1125 installed above the TV to facilitate the PS3 and Rogers cable box. New electrical outlet and a cable jack had been installed to hide all wires. 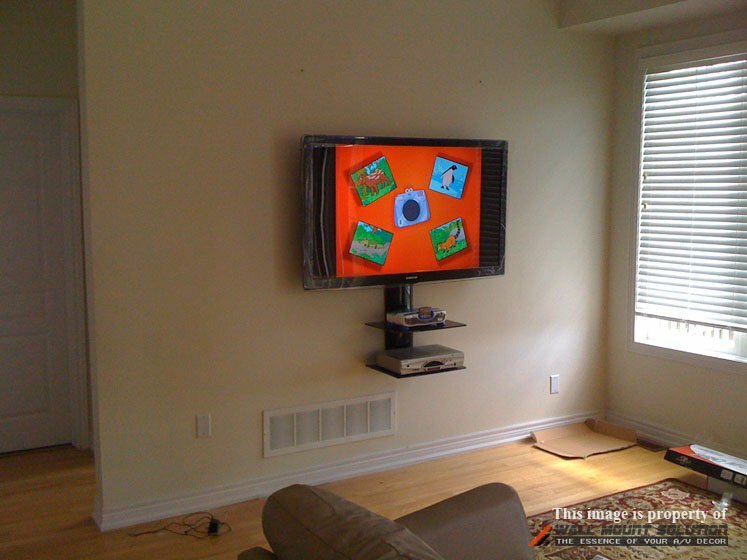 Figure 10 shows 50″ Samsung TV mounted in living room of a condo. 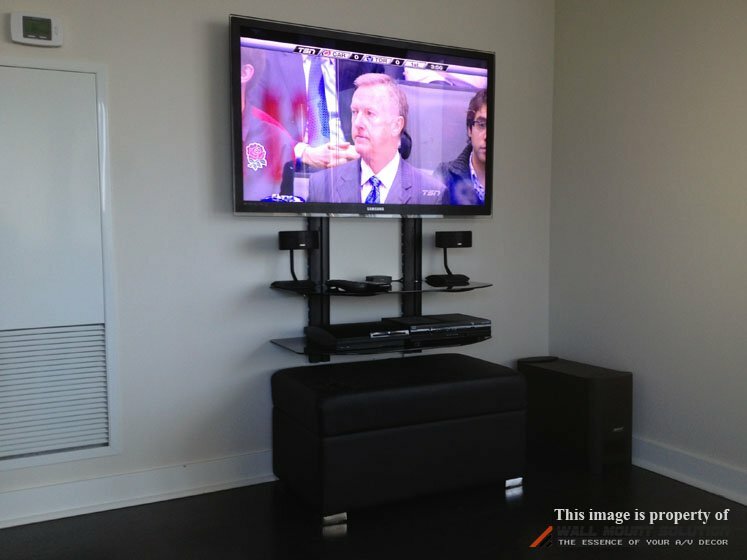 2 tier wide shelves Product ID: 1125 installed below the TV to facilitate PS3, Rogers box and 2 Bose Satellite speakers. Wires managed with wire raceway. 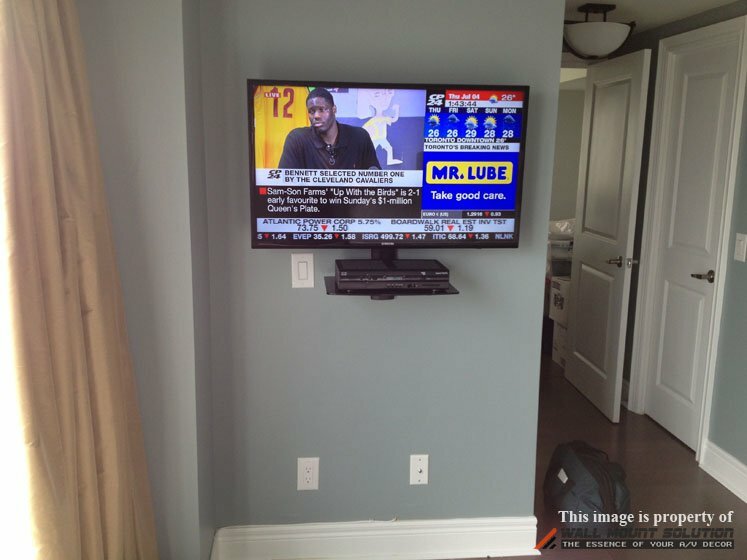 Figure 11 shows 55″ Samsung LED TV installed in a master bedroom wall of a house. Single component shelf Product ID: 1057 mounted below the TV to facilitate the Rogers HD cable box. Wires managed with wire raceway. 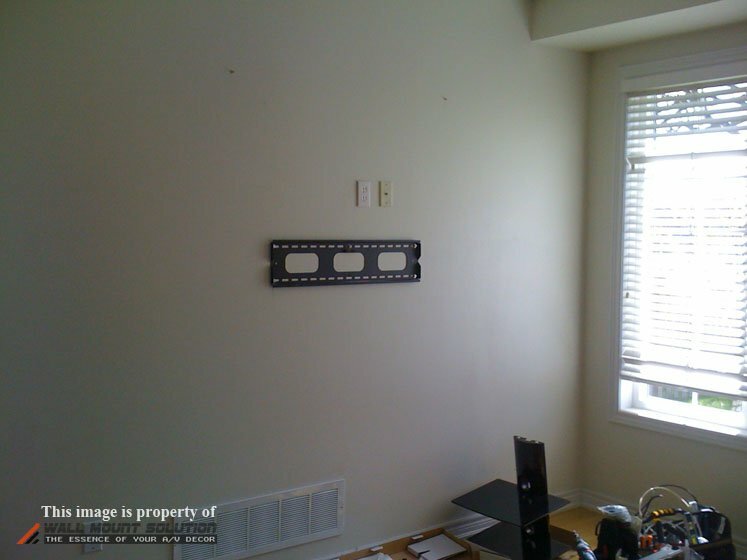 Figure 12 shows a 52″ Sharp TV installed on concrete wall in a condo. 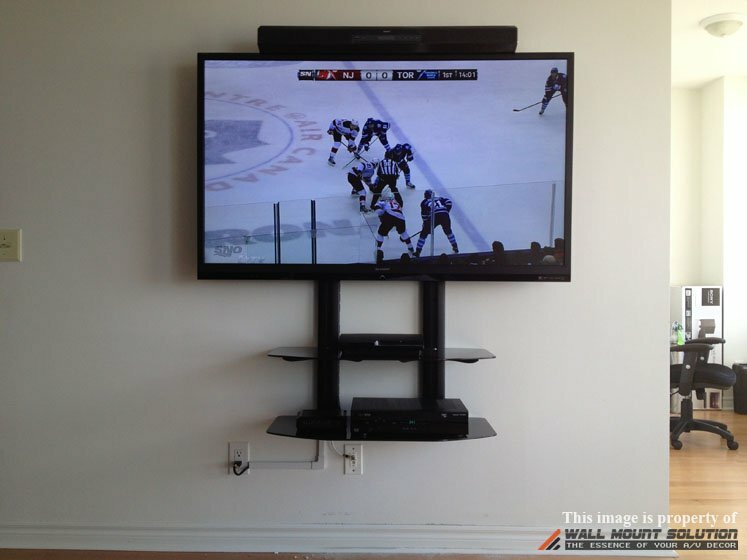 2 tier component shelves Product ID: 1013 (discontinued, replaced with Product ID: 1250) installed below the TV to facilitate Bell Fibe TV box and a DVD player. Wires managed with wire raceway. Figure 13 shows a 50″ Sony TV mounted on the wall. 2 tier component wall shelf Product ID: 1058 installed below the TV to facilitate the bluray player on the bottom shelf and top shelf is reserved for future components. Wires managed with wire raceway running all the way to the adjacent wall where there’s electrical outlet. 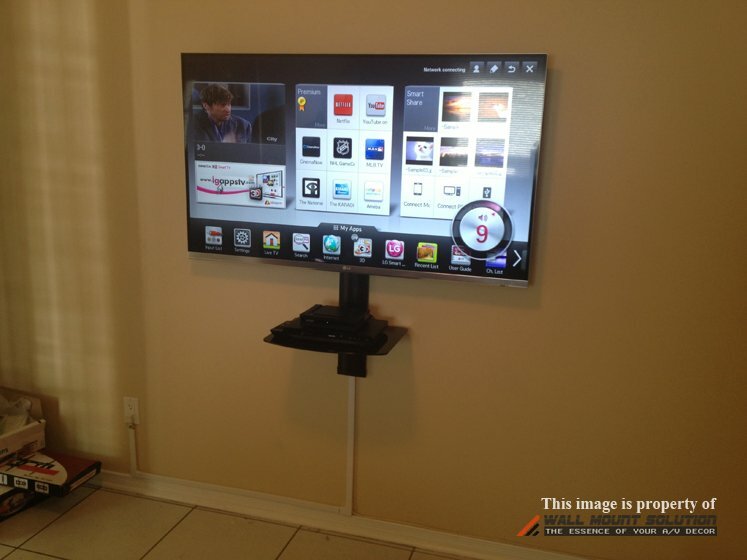 Figure 14 shows a 37″ Samsung TV mounted on concrete wall in a condo bedroom. 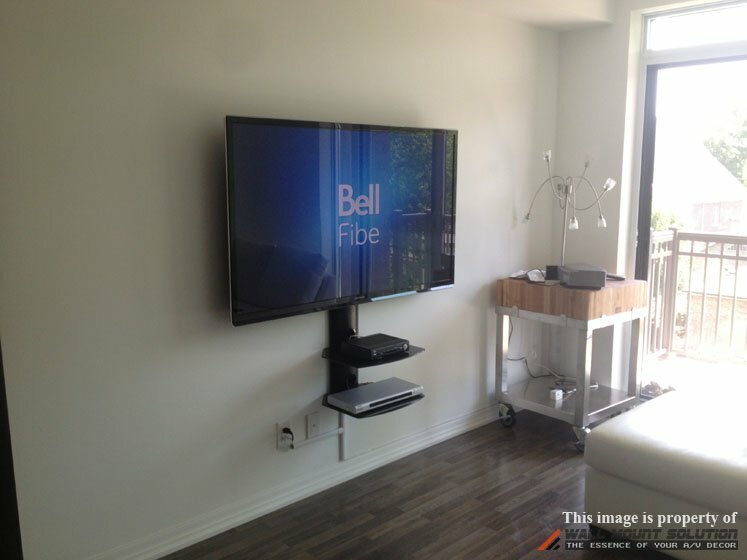 Single component shelf Product ID: 1057 installed below the TV to facilitate Bell Fibe TV box and an Apple TV. Wires managed with wire raceway. 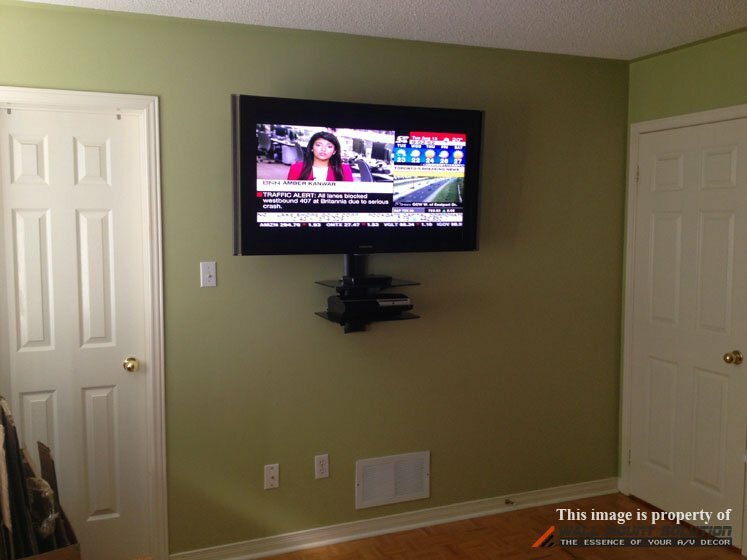 Figure 15 shows a 47″ Sharp TV mounted on concrete wall in a condo. 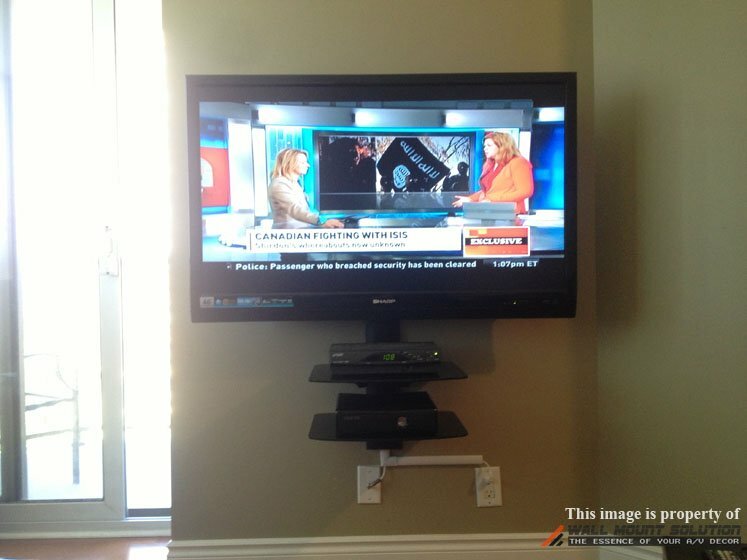 2 tier shelf installed Product ID: 1058 below the TV to facilitate cable box and XBOX. Wires managed with wire raceway. 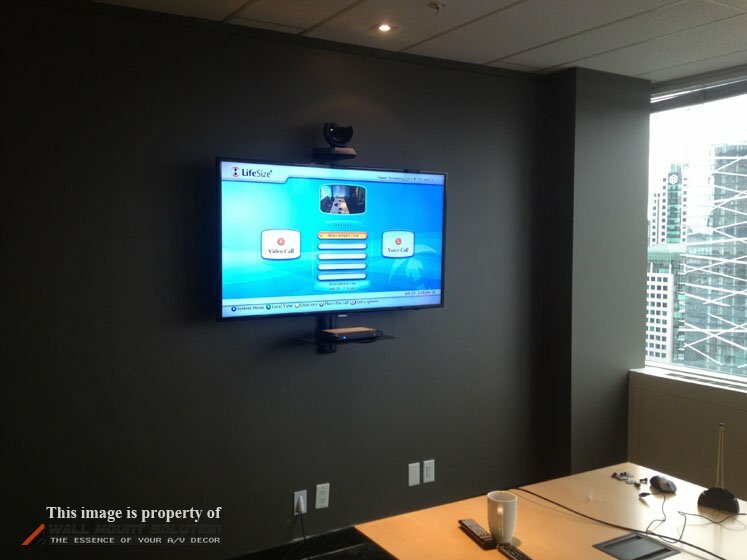 Figure 16 shows a 55″ Samsung LED TV installed in a boardroom of an office building. Single component shelf Product ID: 1199 is installed below the TV to facilitate “LifeSize” video conference system module. “LifeSize” camera mounted above the TV using its own bracket. Figure 17 shows 55″ LG LED TV mounted on the wall. Single component shelf Product ID: 1130 (discontinued) installed to facilitate Blu-ray player and a cable box. Wires managed using wire raceway.